Fri, Mar 22, 2019, 08:52 pm SL Time, ColomboPage News Desk, Sri Lanka. Mar 22, Colombo: Sri Lanka's Marxist party, Janatha Vimukthi Peramuna (JVP) held talks with the ruling United National Party (UNP) today regarding the 20th Amendment to the Constitution seeking abolition of the executive presidency. The UNP leader, Prime Minister Ranil Wickremesinghe and Minister Malik Samarawickrama participated in the talks held at the parliamentary complex today. Party leader MP Anura Kumara Dissanayake, MPs Vijitha Herath and Nalinda Jayathissa represented the JVP. JVP MP Herath speaking to media after the talks said today's talks is a positive move towards abolishing the executive presidency. "We have presented our points to get the support of the United National Party to get the 20th Amendment passed in parliament with a two-third majority. What UNP said was that at the last party convention, they agreed to abolish the executive presidency as a policy. 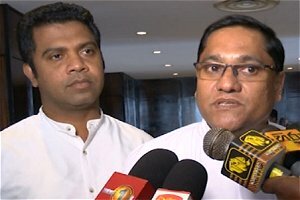 But the UNP said they should have discussions with the other parties. Therefore, we think today's discussion is really a positive move to abolish this executive system," MP Herath said.